Watch our short video to learn more about what anxiety is and how you can manage it. You can also read more on anxiety below. These physical sensations can often be very frightening and distressing if you don’t know what they are. It is not uncommon to feel as though you might be “going mad” if you have never experienced anxiety of this intensity before. These sensations result from our fight or flight response. If a situation prompts these sensations it is our body’s way of trying to keep you safe. We have evolved over millions of years to respond in this way. Each of these sensations occurs to help you to either fight the danger or run away from it. First the brain signals to your body that there is something threatening in the environment. Remember this can be a physical or social danger. Your heart rate will then increase to send blood to your limbs, helping you to ‘fight’ or ‘run.’ This rush of energy can cause your limbs to shake. You may also experience pins and needles in the parts of your body that the blood is leaving – like your hands or your face. The fight or flight response also diverts energy from your digestive and immune systems. This is because in a moment of life threatening danger these systems are not immediately necessary. This means that you can feel very run down or get ill if you have repeated triggering of this system. It also means that you may feel nauseous or like you need to rush to the toilet. Lightheadedness can occur during moments of high anxiety due to our increased breathing rate. If we breath quicker we take in more oxygen creating an imbalance of oxygen compared with CO2 this produces feelings of dizziness and that lightheaded feeling. These sensations feel extremely unpleasant and it is understandable to start to avoid situations that cause anxiety. However, this actually keeps our anxiety going as our body starts to learn that certain situations are dangerous and require a fight or flight response. Avoiding situations means that our body never learns that we can cope with those situations, and it reduces the activities we feel able to do. A panic attack is a rush of these anxious sensations all at once, it feels extremely intense and if you don’t know what it is you can feel like something awful is about to happen. It is often the catastrophic interpretation of the fight or flight response that increases the intensity of the panic attack. If we were to recognise the feelings as a result of anxiety that would eventually pass the fight or flight response gradually reduce. 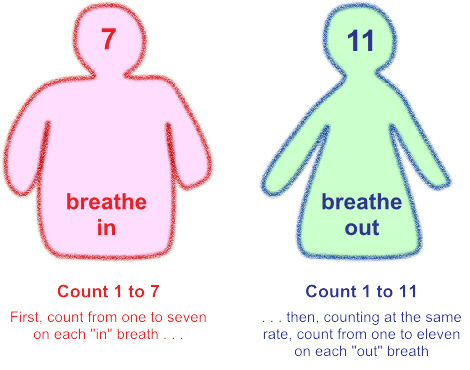 – Breathe in for the count of 7 and breather out for the count of 11. This actively forces slower breaths, which will reverse the fight or flight response. NOTE: People often try relaxation techniques for the first time when they are anxious. They find it too difficult to learn and conclude that it did not work. Trying to learn relaxation techniques when you are anxious is like trying to learn how to ride a bike down a busy motorway in the rain. Relaxation techniques take practice to get the maximum effects from them, this means doing it daily when you are not anxious first. Like learning to ride a bike initially you will find you have to concentrate very hard to get the technique right, but with practice riding a bike becomes very automatic. Relaxation works in the same way. Please feel free to try one of the many relaxation exercises available on our Relaxation exercises page.